Dr. Bieber attended Miami University and obtained his B.S. and Doctor of Optometry degrees from The Ohio State University, where he also did graduate work in physiological optics and in the care of exceptional children. Besides being in private practice since 1968, Dr. Bieber's professional experience includes three years as the optometry officer for Dyess AFB Hospital in Abilene, Texas, and twelve years as a Clinical Instructor at the Ohio State College of Optometry, teaching in the areas of general optometry, orthoptics, and visual perception. Dr. Bieber continues to help train future optometrists by serving as a Primary Care Preceptor for OSU Optometry externs. Dr. Bieber is the author of several articles published in professional journals. His practice interests center on contact lens care, the role of vision in child development, and therapeutic treatment of anterior eye disease. He is a member of the American, the Ohio, and the Central Ohio Optometric Associations, Phi Gamma Delta social fraternity, Epsilon Psi Epsilon professional fraternity, and Beta Sigma Kappa international optometry honorary. Other memberships include First Community Church, University & Northwest Sertoma Club, OSU Alumni Association (Life Member) and OSU Optometry Alumni Association. Patrick R. Dawson, O.D. joined Mt. Sterling EyeCare in 2001. ​Dr. Dawson attended Mount Vernon Nazarene College and graduated with his Doctorate in Optometry from The Ohio State University in 1997. Now in private practice in Springfield and Mt. Sterling, Dr. Dawson's professional experience includes Assistant Chief of the Eye Clinic in Wuerzburg Army Hospital at Germany, where he also served as Chief Preceptor and Clinic Instructor. In addition, Dr. Dawson has taught at The OSU College of Optometry as a Clinical Instructor in the Primary Vision Care Clinic and in the Diagnosis and Management of Ocular Disease Clinic. Dr. Dawson is currently a member of the American and Ohio Optometric Associations, Springfield Arts Council and Springfield Kiwanis. He loves spending time with his sons, Noah, Lukas and Adam. He also enjoys golfing and running and is an avid musician. Dr. Julie (Stickel) Gossard is a Madison County native, graduating from Madison Plains in 2005. She received her B.S. from Mount Vernon Nazarene University in 2009 and her Doctor of Optometry from The Ohio State University College of Optometry in 2016. She completed her internship training through the Dayton V.A. Medical Center and Erdey Searcy Eye Group, an ophthalmology practice that focuses on cornea and cataract care. Dr. Gossard has been working closely with Dr. Bieber as a technician since 2009. She shares his passion for primary eye care and has interests in ocular disease and contact lenses. fraternity and the Lions Club at The Ohio State University. Dr. Gossard and her husband Justin were married in June, 2016. They recently moved into their first home, which they share with their two furry friends, Cooper and Reggie. ​Dr. Taylor Peters earned her B.S. from the University of Kentucky and her Doctor of Optometry from Indiana University School of Optometry in 2016. She has a special interest in learning related vision disorders, vision therapy, and myopia control in children. Dr. Peters is a member of the American and Ohio Optometric Associations, serving as a zone governor and a member of the Young OD committee. In her free time, Dr. Peters enjoys quilting, spending time with family, and being outdoors. Recently moving to the area, she enjoys meeting residents of the local community. When you call Mt. 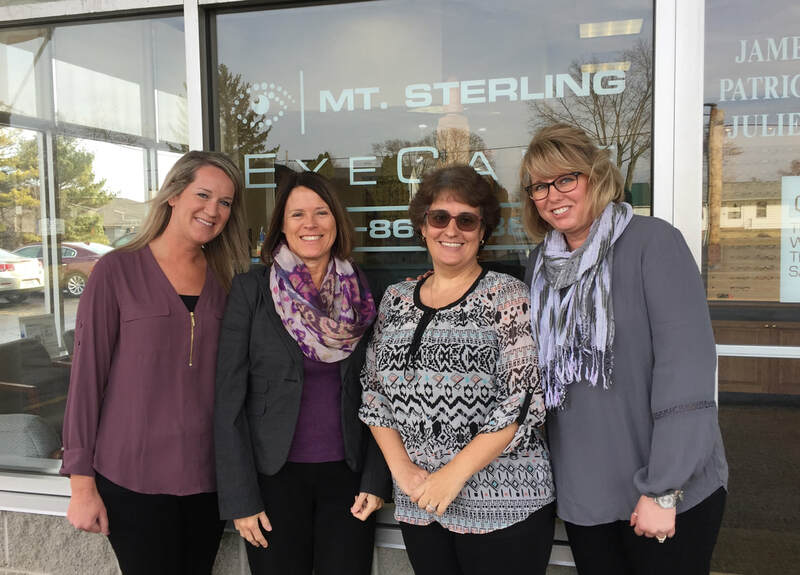 Sterling EyeCare you'll be greeted by one of our friendly staff who will assist you in scheduling an appointment that best fits your schedule. We'll also help you to maximize use of your vision insurance. You will find our staff at Mt. Sterling EyeCare pleasant and caring, as well as knowledgeable in the latest eyecare products. Every patient is given personal attention by one of our licensed opticians and is never rushed to make a decision about their choice of eyewear. Lens options are carefully explained and our stylists enjoy helping you select frames from the latest up-to-date selection. Our opticians will carefully dispense your eyewear to fit you personally. We take pride in helping you to make the right choice of eyewear to fit your individual lifestyle. If you desire to join the millions of happy contact lens wearers, we will thoroughly instruct you in proper handling and caring for them. We'll make sure you are comfortable with the insertion and removal of your lenses and keep you up to date on the latest designs and colors available. We are sure that our staff will make your visit to Mt. Sterling EyeCare an enjoyable one!